5-ingredient Copycat Peanut Butter M&Ms made with gluten-free ingredients and sweetened with manuka honey! I have a thing for peanut butter. It’s been going strong for about 28 years now and it’s safe to say I become more and more obsessed daily. Do you guys have those foods that have always been a favorite? They’re somewhat nostalgic in a way and no matter what you are craving, it always hits the spot. That for me is peanut butter. It brings me back to my childhood aka when I would eat PB&J everyday. Except I still do eat it a few days a week for lunch. I used to bring it to work when I commuted to an office and everyone would think I was crazy, but I didn’t give a hoot. Nothing was stopping this love affair. When it comes to the whole candy topic, one of my favorite questions I ask people is what are their top 3 favorite candies. I don’t mean the healthier organic ones we get now but the ones we looked for when trick or treating or at the movie theater. For me, it was all things Peanut Butter M&Ms or Reese’s Pieces. My Mom used to get me a bag of Peanut Butter M&Ms every single year for Valentine’s Day. And I’m not talking the single serving bag, the big a$$ bag and it would be gone in a couple days. I was obsessed (and let’s be real – still am). 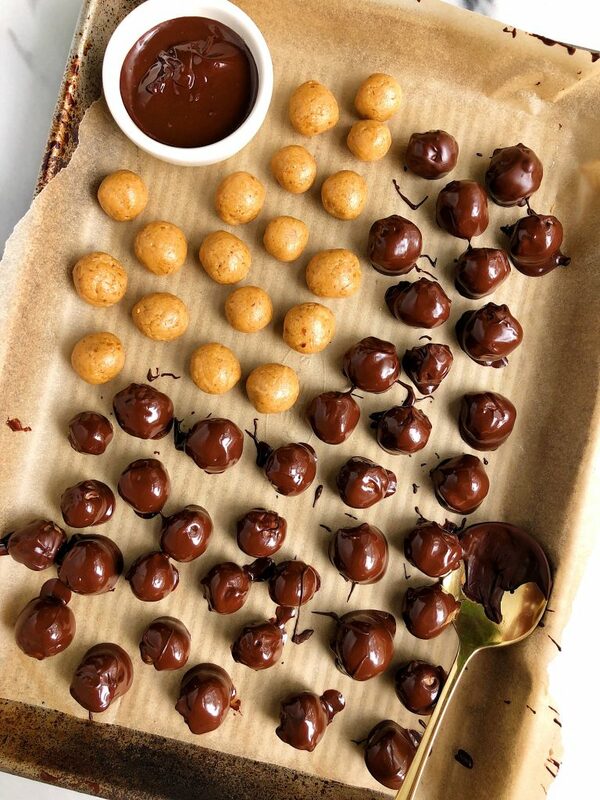 I never thought about making my own Copycat Peanut Butter M&Ms until recently when I was planning some October content for you guys. This recipe clearly isn’t as good as the red bag filled with the artificial colored chocolates, but they sure did go quickly over here. I couldn’t stop popping them in my mouth throughout the day. It was like every time I passed the fridge, I just had to take a few. What I love about this recipe is how simple and easy it is to make. I use all gluten, grain and dairy-free ingredients plus they are sweetened with manuka honey from Wedderspoon. You guys have been seeing Wedderspoon all over my blog and Instagram for awhile now. It is my go-to sweetener for all non-baking treats and I always use the same brand. I’m a creature of habit but I also am pretty particular on the quality of ingredients I use and Wedderspoon I can trust. 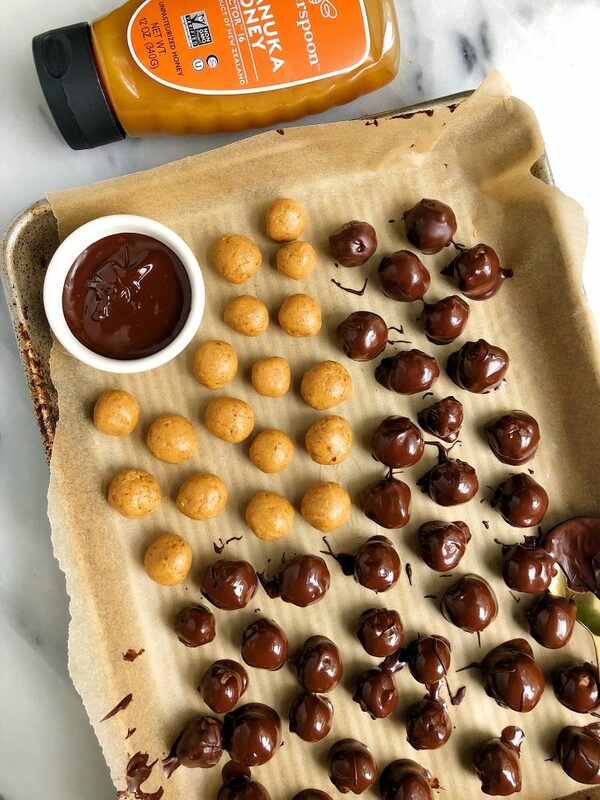 October is non-GMO month and I wanted to give you guys a little bit of background on Wedderspoon and why I use their Manuka Honey. Their manuka honey comes straight from the source in New Zealand, and NZ actually just passed a new global standard to help eliminate any confusion on what true manuka honey is. Many brands make mock honey that isn’t the high quality that they promise. Wedderspoon’s manuka honey is approved from New Zealand and their new standard. If the manuka honey has “packed in New Zealand” on it, you know it is authentic. Wedderspoon takes pride in its process to make manuka honey that is freshly produced by bees. They don’t add anything to it or take any of the nutrients away (aka they’re amazing). Definitely something to keep in mind when you are shopping for good quality, raw manuka honey at the store. 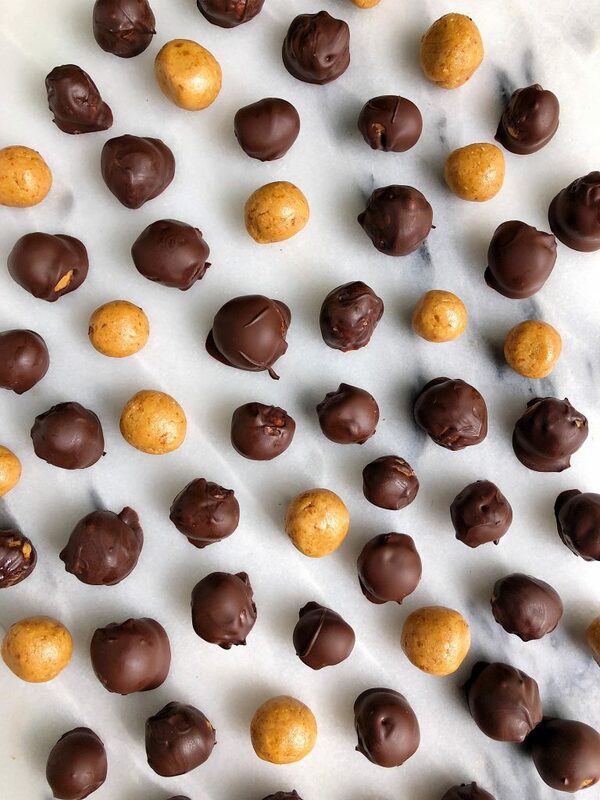 Don’t forget to tag me on Instagram if you make these M&Ms and try some of the other Wedderspoon recipes here on the blog: Crispy Chocolate Peanut Butter Cups, No-Bake Fudge Brownies and Paleo Dark Chocolate Twix Bars. Place on baking tray and repeat for remaining M&Ms and place in fridge for 30 minutes to set and enjoy! Thank you Wedderspoon for sponsoring this post! It means so much to me to partner with brands I love and believe in on the blog. Hey Rachl! This recipe is bomb! I just thought I’d mention you left out the vanilla in the recipe but I assumed it went in the mixture. Again the recipe is so good! And I pretty much love all your sweets. Thanks for taking the time in developing all these awesome recipes.